I have just totally lucked out with my student teaching placement. Two snow days on either end of my weekend!! This should mean that I am super prepared for the rest of my week at school... But I'm partly prepared, is that enough? I sure hope so. With all this free time, I've been able to plan for both classes I am teaching this week, 11th grade government and 6th grade Social Studies. I love my 6th graders quite a bit. They still aren't quite teenagers, but they aren't little kids any more either. Because I am able to see the difference in middle school and high school every day I go in, I am most definitely leaning more toward teaching middle school, or at least the lower grades of high school. But enough about my teaching. 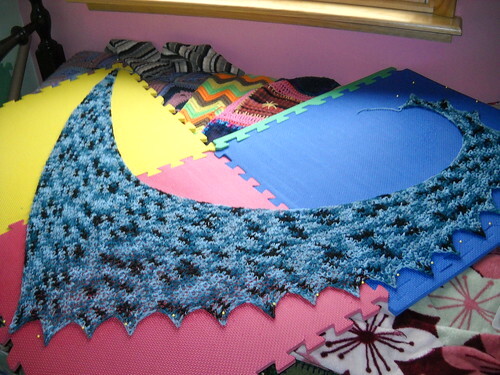 I have had some time to knit and crochet this weekend. I started the weekend off strong by finishing my Snowdrop! 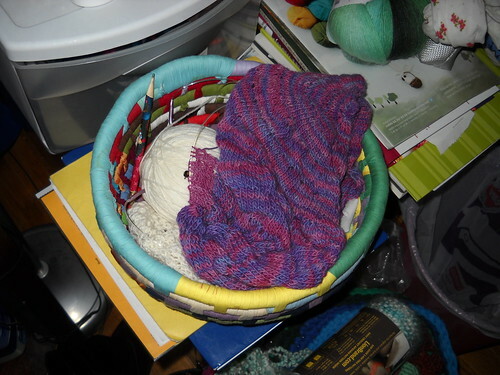 Friday night, during our weekly viewing of CSI: NY, I reached the end of my yarn. Toward the end, I thought I would never see the end of the yarn. But I did! Throughout the weekend, I made other attempts to finish some of my long-term projects, and while I did not succeed, I still made headway on them. in the picture above, you can see the purple-pink of my knitted Citron, my first big lace project that has been on the needles since January 2012. Underneath it is a knitted poncho, in Knit Picks Bare Stroll (Superwash wool & Nylon). The poncho is a commissioned item for a friend, paid for and everything. The pattern, which the recipient picked out, calls for 18 or so "wedges". Over the weekend, I started on the 3rd. Both of these projects need to get out of my room in FO form before I move out in July/August. So I do have a deadline for them, and with the way I've been knitting this weekend, I seriously hope I can have them both done before the end of the school year. All in all, my four day weekend has been productive. I'm hoping to make more throughout today, but we shall see.